A little bit of what you fancy does you good. Right? This chocolate and cheesecake recipe is so easy to make. With a bit of preparation it can be easily done in 45 minutes. Line a square 20cm baking tin with grease proof paper. First make the brownie mix by, whisking the eggs until light and fluffy, add caster sugar and continue to whisk until the mixture us pale in colour. Next add the flour and cocoa, I don’t bother to sieve it, saves on washing up. Break the chocolate into small pieces and add the butter to a microwaveable dish. Heat until just melted, be careful not to over do it in the microwave, stir halfway through to make sure it doesn’t burn. Add the melted butter and chocolate to the batter and whisk until fully combined. Place all the ingredients into a desperate bowl and beat until well combined. 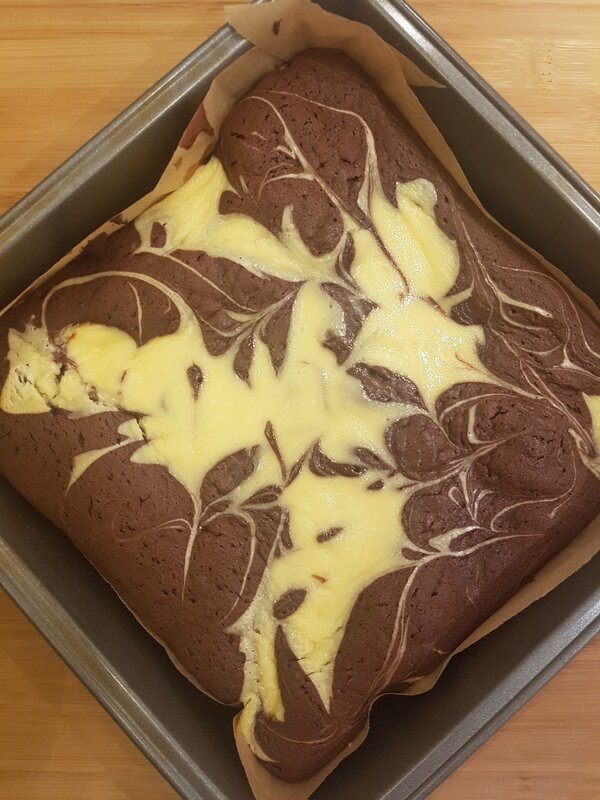 Now for the fun part, take 1 spoon of chocolate mix and put in baking tin, then add one spoon of cheesecake mix, repeat this until you have put everything in the tin. Now with a wooden skewer drag the 2 colours together to form a marble effect. Gentle bang the tin to level the mix out and place in the oven for 30 to 35 minutes. It still needs to have a slight wobble on it when it’s done. Slice into 9 pieces, serve warm with ice cream or on it’s own. Be warned it’s very moreish.